Thomas Nelson President John Dever (center) is flanked by (l-r) Dental Hygiene Program Director Dr. Harold Marioneaux Jr.; faculty members Christina Quirós and Margaret Capocelli; and Historic Triangle Campus Provost Dr. Patrick Thompson. Thomas Nelson Community College’s Dental Hygiene program received special recognition from the Williamsburg Health Foundation on Oct. 17 during the organization’s 2018 annual awards event. 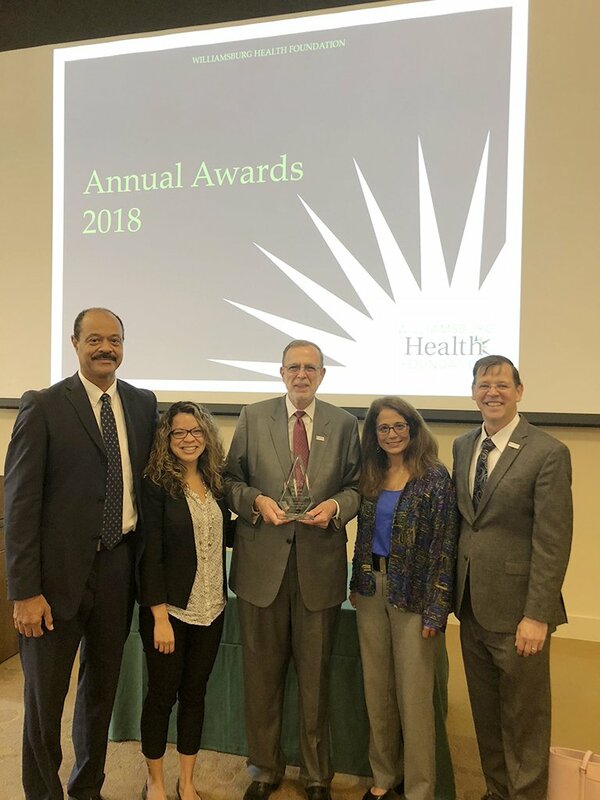 In presenting its 2018 annual award to the Virginia Oral Health Coalition, which raises awareness about the need for oral health delivery systems in Virginia, the Foundation acknowledged the College among five local provider groups that offer free or low-cost oral health services. Thomas Nelson’s Dental Hygiene Director Harold Marioneaux Jr. was joined at the event by Thomas Nelson President John Dever, who accepted the award on the College’s behalf. Others on hand representing the College included Historic Triangle Campus Provost Patrick Tompkins along with Dental Hygiene faculty members Christina Quirós and Margaret Capocelli. Marioneaux appreciates the acknowledgement. ”No one gets there alone. This was a team effort,” he said, thanking students, faculty and staff for their role in the program’s success. Thomas Nelson added the associate degree in Dental Hygiene in August 2010 to complement offerings in the Health Professions division. Housed at the Historic Triangle campus in Williamsburg, its clinic began offering free services to community members in January 2018 having offered low-cost services for several years prior. Patrons can receive various oral health services performed by students under faculty supervision including dental sealants, extrinsic stain removal, full-mouth radiographic series, custom fluoride tray and more. Marioneaux said the program is enriched by the community’s support. The hands-on experience students receive working with real patients coupled with classroom instruction helps the program turn out top-notch graduates. Its 2018 class of nine students passed the National Boards and Southern Regional Testing Agency license exam. This marked the seventh consecutive year the program experienced a 100 percent pass rate on national board and licensing exams. More than 60 students have completed the program to date. “Thomas Nelson’s Dental Hygiene Program has some of the best student outcomes in the Commonwealth of Virginia,” he said. In addition to Thomas Nelson, others acknowledged by the Williamsburg Health Foundation during its awards event included Child Development Resources, Lackey Clinic, Norge Dental Center and Olde Towne Medical & Dental Center. But, Holland said, “The Williamsburg community could be an exemplar for the state if not the nation” due to its integration of dental and medical care in its safety-net clinics. It is also clear that the Greater Williamsburg community has many individuals volunteering their time to provide oral care for those in need. The Williamsburg Health Foundation serves Williamsburg, Poquoson and the counties of York and James City. The Foundation has a corpus of $122 million and distributes an average of $5 million dollars annually working with multiple partners to reach its vision of “individuals making healthy choices in a community with health opportunity for all.” Learn more about the Williamsburg Health Foundation at WilliamsburgHealthFoundation.org.